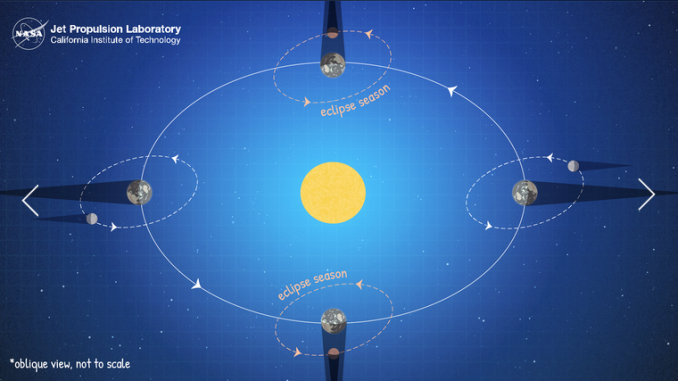 When a full moon occurs during an eclipse season, the Moon travels through Earth's shadow, creating a lunar eclipse. Illustration from NASA/JPL-Caltech. The moon, Earth and sun will line up on Sunday (Jan. 20) for the only total lunar eclipse this year and next. At the same time, the moon will be ever so much closer to Earth and appear slightly bigger and brighter than usual — a supermoon. It begins with the partial phase at 7:34 p.m. PST Sunday. That’s when Earth’s shadow will begin to nip at the moon. Totality — when Earth’s shadow completely blankets the moon — will last 62 minutes, beginning at 8:41 p.m. PST Sunday. As for full moon super moons, this will be the first of three this year. The upcoming super moon will be about 222,000 miles away. The Feb. 19 super moon will be a bit closer and one in March will be the farthest.